We use only the highest quality large format scanners on the market and you can expect the quality of your scanned images to be better than that of the original. Our high speed, large format, production grade scanners come equipped with features that bring out every detail in your originals (up to A0 and up to 1200 dpi optical resolution). This enables us to provide you with top quality digital images in either black-and-white, grayscale or full color. In addition, we use our own proprietary technology to control, streamline and automate all our scanning operations, from A to Z – ScanFactory Resource Planning (SRP). It was developed entirely in-house by our expert personnel. Its main purpose is to reduce human intervention to an absolute minimum and remove the risk of human error. This highly sophisticated, one-of-a-kind technology offers complete traceability and provides full real-time reporting functionality. The Customer Portal allows you to search for and consult the status of every document processed by ScanFactory at any point in time (e.g. In Transport, in Scanning, etc.). The Portal also makes it possible to make requests for urgent scanning or physical delivery of a particular document, and view full history of such requests. All information and metadata about every single document, including its exact physical location, are stored in the SRP database and can be retrieved on-demand. Our experienced project managers will work with your staff to determine the special requirements of your project. All of our procedures are designed to maintain a high degree of accuracy throughout the process. Our ScanFactory operators are highly trained professionals equipped to handle oversized documents of any type with care. A secure and sealed iGuana vehicle comes and picks up your engineering or architectural drawings, construction plans, maps, etc. First and foremost, a set of clearly defined quality control procedures governs every single step of our scanning process, from Pick-up of your wide format documents to Metadata & Image Delivery. Every action taken in relation to individual documents is tracked in our SRP system in real time. The SRP system has built-in quality control features (as do all large format scanners used at ScanFactory). Complex quality control algorithms analyze every single image, flag images that are suspected to have a quality issue and automatically alert our Quality Supervisor to take action. In addition, SRP utilizes a 16-core server dedicated exclusively to post-scan image processing. It performs a variety of algorithmic image enhancement functions (in addition to native scanner functions). Our scanners utilize high-end custom lenses that are specially designed for scanning resolution, ensuring against various issues such as uneven sharpness, chromatic errors, colour fringing (black lines showing up in colour). They are also equipped with advanced features that bring out unseen details and restore even the faintest originals. Our scanners can scan in vibrant colour in sRGB, Adobe RGB, etc. We can capture and improve your maps using advanced colour reduction options, or digitize and restore monochrome originals with unique adaptive filters and advanced background suppression. Complex thresholding algorithms combine background cleaning and preservation of grayscales in one mode, and are used to clean new originals or work with low contrast blueprints. Other quality control features include: up to 1200 dpi optical resolution, full image adjustment control, auto-rotation, auto-alignment, deskewing, sharpening and smoothing filters, black and white level adjustment, RGB level adjustment, and more. Whether your large documents are folded, rolled-up, flat, brittle or delicate, they will be safe in our hands. If necessary, we will protect your documents with mylar carriers. We are committed to ensuring the best quality capture from even the most challenging originals. Last but not least, our employees are trained to apply ISO 9001 Quality Management principles in all their work. Our ScanFactory operators are trained in capturing and indexing descriptive information and revision dates from the title block of drawing scans or anywhere else on the surface of drawings, maps, blueprints and other documents. For example, project plans and other multi-page documents can be captured as single set or multi-page files that encompass various plans or drawings from the same set. We will work with you to ensure your documents are scanned and indexed in a way that makes the subsequent retrieval process as simple as possible for your organization. We can also perform OCR for text searchable PDF files and prepare images and metadata for import into your back-end databases or document management software. We can convert your paper drawings to CAD format, presenting you with fully editable CAD vector files and allowing them to be viewed and edited using CAD software such as AutoCAD. Paper drawings are drawn up into CAD format to match the original drawings exactly. Any information you wish to be presented on the final CAD file can also be marked out onto these drawings. Additionally, you can request for your own symbols or details to be added. All CAD files are drafted at full-scale (where scales are provided), with CAD layering and 100% line connections. Delivery of images and metadata can be done via a Direct File Transfer method (VPN) or External Storage Device method (e.g. encrypted Hard Disk, USB sticks, etc.). You decide which option suits you best. Delivery is a fully automated process governed entirely by SRP. During scanning, all scanned images and metadata are stored directly in the SRP database. These images and metadata are automatically exported from SRP without any human intervention whatsoever. As a result, you have virtually unlimited flexibility in choosing your preferred image and metadata file formats. What would you like us to do with your documents once scanned? 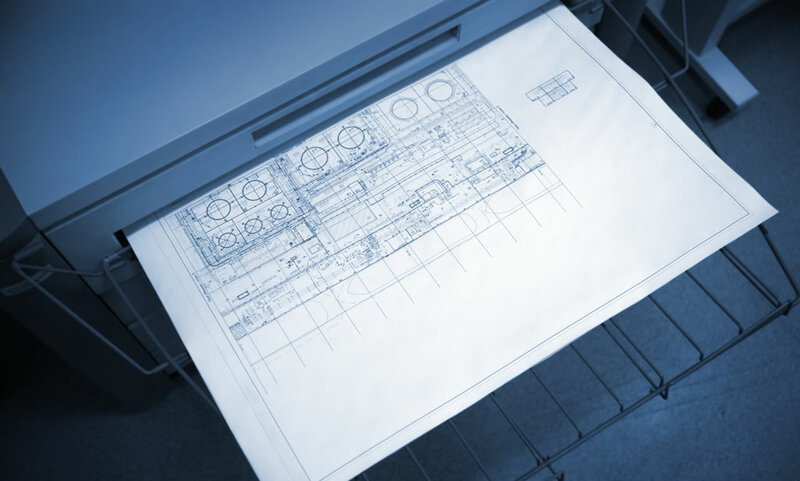 We can print all types of large format documents up to size A0. This gives you the freedom to make physical edits to a copy of a document, or print multiple versions of the same drawing. Using our production scale printers, we able to produce high quality prints quickly and efficiently. We can print in both, black-and-white and colour. Combine this with our efficient folding and delivery service and you have the perfect solution for your large format printing needs. Print any document up to A0 with our professional printing services!